Dance events are most successful when everyone follows guidelines and etiquette to keep others safe and comfortable. These are the guidelines I strongly suggest for every convention formal I host, whether they are posted by the con itself or not. Please be aware that the convention's code of conduct always applies in addition to my suggestions. This is not always the standard of etiquette everywhere, however, you may refer to them if you wish to upgrade your local convention's formal ball standards. If you have any questions, email ballroom@trickssi.com. You must adhere to the convention's code of conduct at all times. Please follow the dress code. Those who do not risk missing out on the event. If you have questions about your outfit, you can contact me at ballroom@trickssi.com. I'm also on Twitter, Instagram, and Facebook. Please make sure to drink water. Find out before the event if water stations will be inside the room; if not, plan to bring a water bottle. You will need it. Take breaks when you need them! Spending hours dancing plus walking around a convention all day is going to be draining for anyone, so please take care of yourself. Before coming to the convention, check to see if the event has a dress code. If it does, make sure you have something to wear that is in compliance with it. Many venues have strict guidelines for footwear to protect their floor. I encourage you to practice moving around in your outfit before coming to the dance, to find out if it restricts your movement, may trip you up, or if there's a risk for a wardrobe malfunction. Adhere to hygiene and sleep guidelines. Make sure you're well-rested; showering, deodorant, and overall cleanliness are important when asking people to dance! The dance floor is for dancers only. Anyone standing and conversing will be asked to move to the side areas of the room. Beyond not interrupting the flow of dance, this is for your own safety as well! If you'd like to be asked to dance, try standing towards the front or on the direct sidelines of the floor, to indicate you're interested. If you're sitting down or standing in the very back of the room, it looks as if you're unavailable. Along the lines of rule #6, never feel as if you're required to bring your own partner, or you can't attend unless you have a designated partner. Your dance partner does not necessarily have to be a romantic partner, and you shouldn't expect to meet your Prince/Princess/Royal Charming at an event like this one. We're here to have fun and dance as a community! Please respect everyone's reasons for dancing! This is something I discuss in my panels, and I've gone into more detail here. Anyone may ask anyone to dance, and anyone may dance lead/follow! Please ask your partner what their preference is, or tell them of yours if you can only do one or the other. An easy way to bring this up is to not only ask, "Would you like to dance?" but also, "How would you like to dance? Gender/gender-role policing based on appearance will not be tolerated. If someone asks you to dance, you may choose to decline for any reason. However, it's polite to sit out the entire dance in that case. (For example, if you say "no" to someone who asked first and then "yes" to the person standing next to them, it wouldn't make them feel very good.) If someone asks you to dance and you decline, but that person won't respect your wishes and you feel that you are being harassed, please reach out to a staff member or contact security. Asking or forcing someone to dance every single dance in a row without allowing them to dance with other partners. Non-consensual and inappropriate frame holding (i.e., with a hand too low on the back, hip, or buttocks, or on the chest; or holding a partner too closely and invading the space of their neck, face, or other parts of the head). Depending on the severity and visibility, this may also be offensive to other guests and should not be exhibited in public. Non-consensual dipping or lifting. Lifts of any kind are prohibited regardless. Intentionally cutting others off or bumping into others. Intimidating others on the dance floor by "showing off" and creating a gathering of spectators on the dance floor. This creates danger for other dancers. You ARE disrupting them and their experience. However, if you're on the side of the dance floor, respecting all rules, and your spectators are off to the side of the dance floor, that is permitted. Becoming sexually excited (regardless of gender identification) and not removing yourself from the partnership. This may include forcing your partner to remain in frame without allowing them to leave. Note: There is NO reason a dance frame should be regarded as an organic, isolated cause for someone to become sexually excited. It is NOT an excuse to touch or remain in physical contact with someone. If you are unable to dance without become sexually excited, you must refrain from asking others to dance. No lifts. No large group circles. No moves that endanger others (such as breakdancing or flailing your arms around without looking. This is very important. These kind of moves are best suited to showcase performances. It doesn't matter whether you are trained to perform lifts. Someone watching might end up getting too close without your knowledge, or they may want to try it for themselves and injure themselves or others. Likewise, we want an even playing field. It doesn't matter if you're the top showcase dancers in the world; we're here to dance socially with others and that includes not intimidating others into believing they aren't good enough because they aren't as trained as you and can't do the lifts you do. Please be reminded that intimidating others can include dancing to generate an audience and disrupting the dance floor, and is therefore considered harassment. Dips are highly discouraged and only permitted if you can provide proof of dance experience. I've seen too many "confident" people drop their partners or fall to the floor—it can lead to serious injury! Breakdancing is highly discouraged. It is a solo activity and not appropriate for a formal setting. This includes doing the worm. The only exception to this is if you safely incorporate it into one of our specified line dances. Any studio and competition in the world will enforce this rule, with the exception of showcase competition and performance pieces. I enforce it because it makes sense for the safety and enjoyment of others. Please follow the Dance Floor Etiquette image below. Line of dance means the leader is facing and traveling counter-clockwise on the floor. Some songs might have two or more dances that can be done simultaneously, so pay attention to where spot dances vs. traveling dances are. I will have a presentation playing along with the music, which will provide guidance as to what dance(s) you might want to dance to each song. 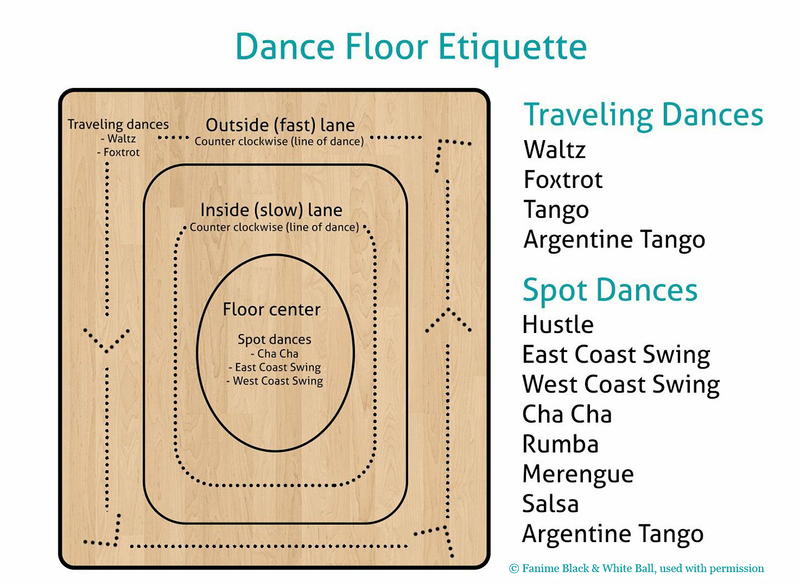 Also please note that new dancers should stick toward the inside, as more experienced dancers are more likely to use the outside of the floor. Thank you to the FanimeCon Black & White Ball staff for allowing our use of this graphic! Do not repost or share without permission. © Fanime Black & White Ball.